In the late 1970s, during the long years of waiting for international and domestic funding to come together to produce Kagemusha, Akira Kurosawa returned to the pastime of his youth—he painted. Working fast and furiously, each day turning out scores of sketches and paintings, Kurosawa accumulated a unique body of work that was born as much out of despair and frustration as from a passion to create. One after another, he pulled from his mind’s eye the images he visualized for the epic drama and set down on paper the scenes he ached to re-create on film. Kurosawa began his career as a painter and had always been skilled at drawing. He decided he wanted to be an artist in his teens and later became increasingly associated with what came to be called the Japan Proletariat Artists’ Group. Strongly influenced by the mannerist styles of contemporary German expressionism and Soviet realism, the young Kurosawa’s painting was forthright and dramatic: human figures rendered in powerful calligraphic lines and bold primary colors. His decision in the late 1930s to turn from painting to film was impelled by many factors, including intensified political pressure from the Japanese militarist government against artists and liberal writers, the need to find a more stable livelihood, and the suicide of his elder brother, who had been deeply engaged in the film industry. Unlike directors who are drawn to filmmaking by purely literary instincts, Kurosawa turned to the medium to express his visual imagination as much as his narrative interests. From the outset, he was known for the care he lavished on storyboards, which he drew himself. The visual richness of all his films grew systematically out of the precise sketches and detailed storyboards he prepared for them. Scripts were almost always written in collaboration with two or three writing partners, but Kurosawa reserved for himself the translation of prose scenes into visual images. It was a process of linking eye and brain that had always been his favorite way of working, and indeed he knew no other. well, his sketches and drawings had sprung immediately into three-dimensional life, in a matter of only days or weeks. But by the time of Kagemusha, he was having great difficulty finding support for his projects, and the pace of filmmaking had slowed. 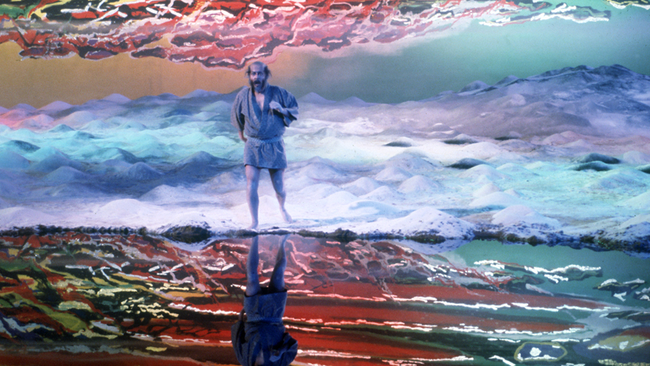 So for nearly four years—as he waited for funding to come through for Kagemusha—he “directed” his actors and scenes in his head, and set down his mental images in complex, full-scale paintings. A medieval samurai drama had been festering in Kurosawa’s creative mind for more than a decade, since shortly after he finished the long, difficult shoot for Red Beard in 1965. Back then, it was barely more than an idea, and neither story nor concept for the film had begun to take shape. He was intrigued with the notion of multiple identities and the idea that a great historical character displayed different “faces,” or even different personalities, in different situations. He was also still reading Shakespeare and—having found considerable success with his adaptation of Macbeth as Throne of Blood and his rethinking of Hamlet as The Bad Sleep Well—had long been fascinated by the idea of a “Japanese” Lear. But in the late 1960s, the subject of the medieval samurai film remained inchoate, and Kurosawa found himself increasingly distracted by other projects and other problems. The filming of Red Beard left him scarred with a reputation for tyrannical behavior, and for flouting schedules and budgets, that dogged him for the rest of his creative life. His harshest critics were unwilling to accept his perfectionism as adequate justification for his demanding behavior, and frugal film studios feared the cost overruns that a Kurosawa project threatened. His ambitious attempt in 1968 to create a new production company with three other great Japanese directors seeking artistic autonomy—Masaki Kobayashi, Kon Ichikawa, and Keisuke Kinoshita—distracted him with business matters that he was neither comfortable with nor skilled at. Eventually, this resulted in the commercial failure of his 1970 Dodes’ka-den and the impossibility of finding financial support in Japan for future films. Increasingly helpless, Kurosawa allowed himself to be drawn into a Hollywood attempt at a binational project about Pearl Harbor—the disastrous Tora! Tora! Tora! When Kurosawa pulled out because of artistic disagreements with the American producers, he brought upon himself international vilification and an intensified reputation for being impossible to work with. Suffering profound depression, he attempted suicide in December 1971. Two years later, Kurosawa was invited to make a film in Russia by Mosfilm (the Soviet national film production bureau). The experience of shooting Dersu Uzala in the severe winter conditions of Siberia brought first physical collapse and then spiritual resurgence when the film won the Academy Award for best foreign film of 1975. But even with his reputation restored by this honor, the search for funding for his next film—the epic samurai drama he had long dreamed of—grew more difficult than ever before. His own production company had collapsed during the long interval since Dodes’ka-den, and Toho, his customary production studio in earlier decades, was in severe financial decline and unwilling to risk the hazards of a major Kurosawa undertaking. Though the Japanese economy was otherwise booming, conservative investors were similarly nervous about the unpredictability of film production—even with an internationally acclaimed master director at the helm. So while his agents sought production funding throughout the world, Kurosawa withdrew again into the confines of his study at home, unable to do anything but write and paint. Over time, the images for Kagemusha grew more complex—and darker. The original fable, about a great warlord impersonated by a boorish ruffian, gradually took on epic proportions as an allegory about human folly and ambition. The paintings that had begun as simple sketches came to be populated with huge armies of foot soldiers surging into battle against cavalries of mounted warriors and phalanxes of riflemen. As Kurosawa’s spirits darkened with the passage of time and his increasing doubts that the film would ever get made, so too did his palette and the psychological attributes of his characters. Eventually, thanks to the support of two of Kurosawa’s most celebrated admirers, American directors Francis Ford Coppola and George Lucas, Kagemusha did finally go into production, early in 1979. The filming was beset with delays and difficulties (all of which received disproportionate attention from the insatiable Japanese media, hungry to document another Kurosawa failure), but in the end the creative vision of Kurosawa prevailed. The paintings and drawings he had agonized over for nearly half a decade found their true life in a film whose epic grandeur harked back to the masterpieces of Eisenstein, and in the view of many film critics and historians even transcended them. In Kagemusha, the energy of a passionate young artist and the genius of a mature master seem to reunite. The film is as much the triumph of the painter that Kurosawa had been as a youth as of the masterful playwright he had become. It also marks the beginning of the final chapter of his astonishing career as a director. Ran, Dreams, and the other works of his late years benefit from the intensely painterly approach to filmmaking he adopted in his long, painstaking preparations for Kagemusha. Peter Grilli is president emeritus of the Japan Society of Boston and an expert on Japanese society and culture, with a special interest in Japanese film. He was raised in Japan, came to know Akira Kurosawa, and wrote often about the director during the last two decades of his life.